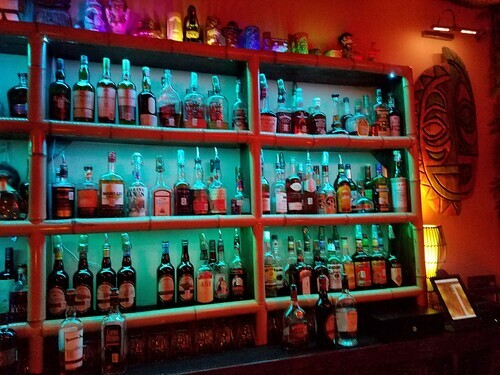 It’s not very common to find real tiki in small cities/towns these days. In fact, it’s pretty much unheard of. 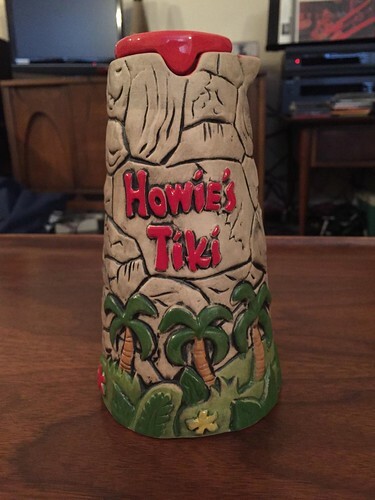 When I first heard of Howie’s Tiki, I thought it was in Houston proper, and was then surprised to learn it was in a “census-designated place” (according to Wikipedia) called Spring, TX, which is outside Houston, and has a population of about 54,000. 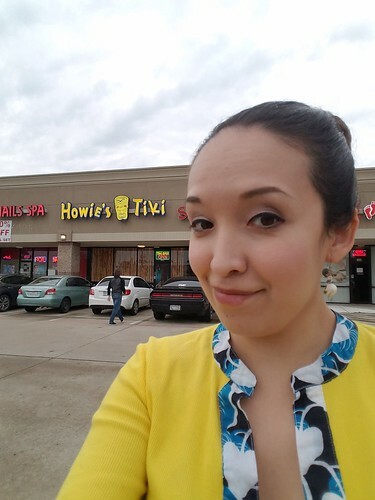 When Todd and I rolled into Houston a couple of weeks ago, we narrowly missed being able to visit Howie’s, so this past weekend, when we went to Lei Low for their anniversary party, we made it a point to make sure we wouldn’t miss Howie’s again. 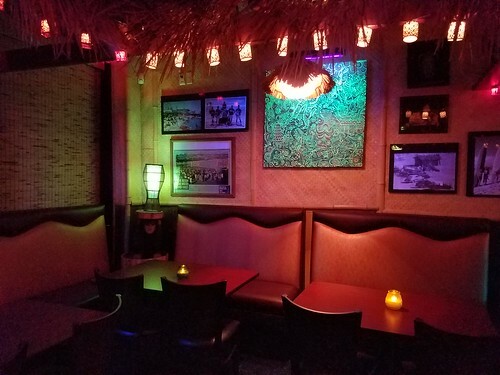 After all, their reputation for legit, on-point drinks and fantastic selection of rums is well-known in the Texas tikiphile scene. After a leisurely 3 hour drive in rainy weather, we got in about an hour after they opened, and the first thing I noticed was the building they were located in. This is another one of those places that falls into the “blink-and-you’ll-miss-it” category. It’s in a little strip center with a few businesses flanking it, so you have to keep your peepers open. After we pulled in, Todd made a beeline for the door, while I lingered behind to snap some pictures. I can’t possibly express how happy I was to see a dimly lit, cozy interior. It was the complete opposite of what was happening outside. Talk about chill – the music playing was a wonderful mixture of exotica, latin beats, jazz, and bossa nova. I instantly felt transported to a totally different place, far away from Spring, TX. The atmosphere was THAT good. 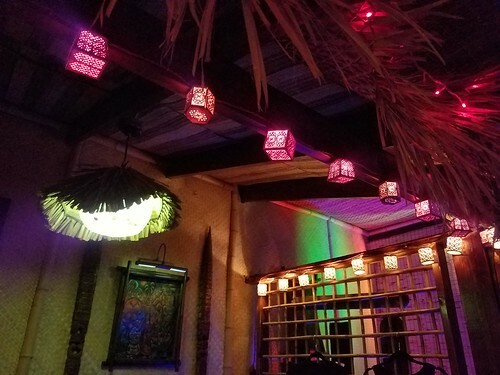 The decor was also wonderful – there was plenty of seating, with soft string lights above, some sweet art by Ken Ruzic on the walls, and plenty of fish float lamps and pufferfish lamps (my favorite). The ceiling, like the walls, was covered in Lahaula matting, which was pretty cool. 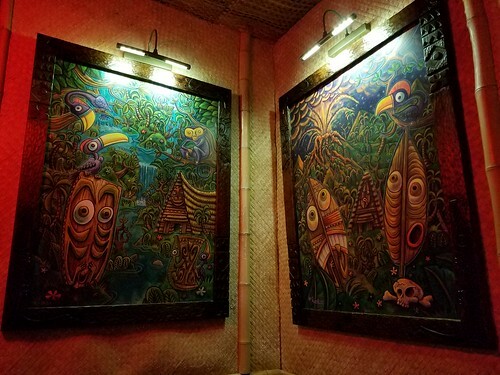 Todd and I were looking for the speakers the music was coming from, and we realized the matting covered them up – I am ok with hiding technology at a tiki bar! 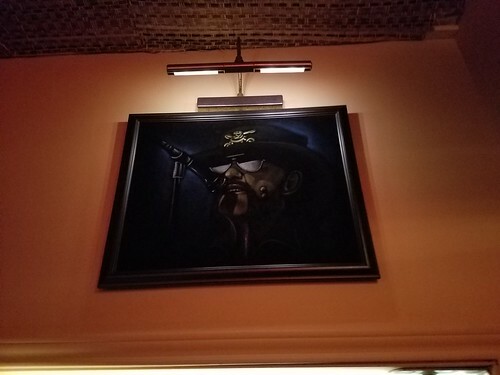 I have to admit, though, one of my favorite things inside the bar was the velvet painting of Lemmy of Motorhead hanging above the entrance to the kitchen. 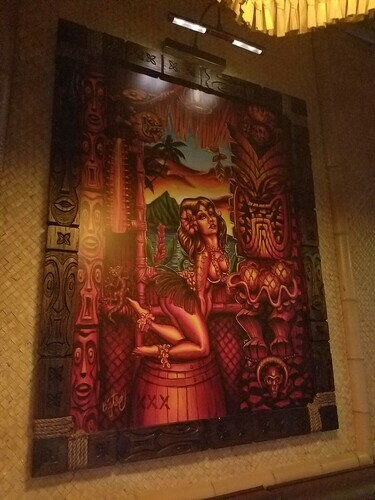 Not exactly tiki, but awesome, nonetheless. Todd and I took a seat at the bar, and had the pleasure of being attended by Mark, a.k.a. “Howie”, the owner-operator. He handed us some food and drink menus, and gave us a very warm welcome. 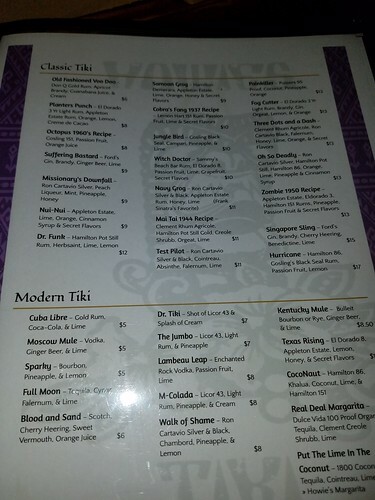 After looking at the menu selections (which are very extensive), we settled on a Mai Tai for Todd, and a 1950 Zombie for me, as well as a couple of burgers with fries. 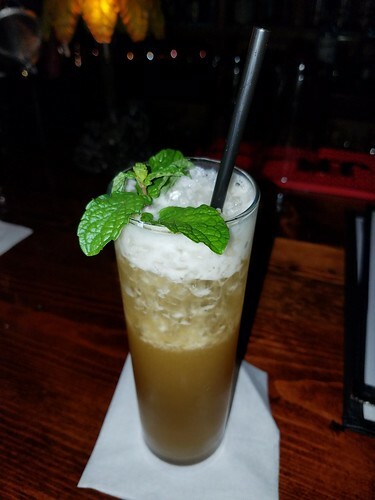 I relished my Zombie…I don’t see many bars that offer this particular version, as the 1934 version is more famous, and therefore, more popular. But this one just blew me away. The rums were potent (but not too much), and the fruit flavors were fantastic. I would totally order one of these again. The Mai Tai Todd ordered was absolutely on point. Strong, garnished beautifully, and delicious (I think I’m lucky I got a taste!) 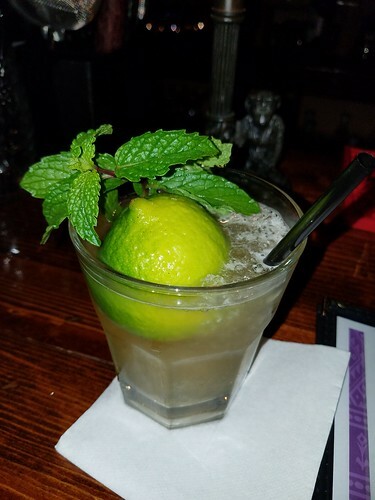 I think it worthy to note that the mint that our drinks were garnished with came from Mark’s garden, and the orgeat, which was house-made, was also NUT-FREE. The secret will remain something only Mark will know, but it was easily some of the best-tasting orgeat I have ever had. It smells exactly like almonds, yet has none in it. Mark told us he is allergic to almonds, and as we all know, necessity is the mother of invention, and what an invention! Do yourselves a favor, and order a Mai Tai when you visit. It’s so worth it. 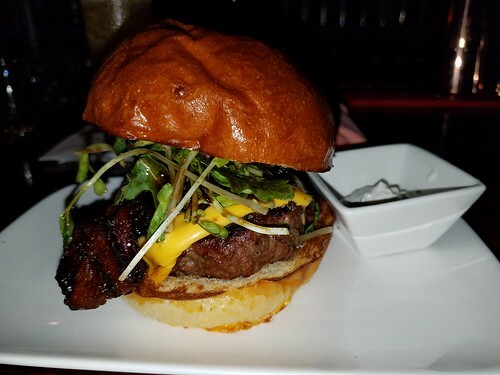 Our burgers came out shortly afterward, and they are a cut above most burgers I’ve tried, even at specialty burger bars. The beef was fresh and super juicy, the candied bacon was awesome (even Todd, who doesn’t normally like bacon, ate it up), and the greens on it were nice and crispy. The order of fries, which are the shoestring variety, were super crispy, and substantial. You’ll want to come with an appetite, for sure. Our last round consisted of an Octopus for me, and a 3 Dots and A Dash for Todd. I wish I remembered more of Todd’s drink to where I could elaborate on it here, but unfortunately, I don’t. But I do remember that my Octopus was solid! The flavors of orange and passionfruit were pleasant, while the Gosling 151 gave it quite a punch. I nursed that one for quite some time, while chatting with Mark and learning about the bar, as well as getting up to take some more photos here and there. We finished our night by purchasing a couple of the signature mugs, which are really unique; they are volcanoes, and come with a small cup that you place on the opening, for a little fire action, if you place a piece of rum-soaked bread in it! Todd and I loved our visit to Howie’s. 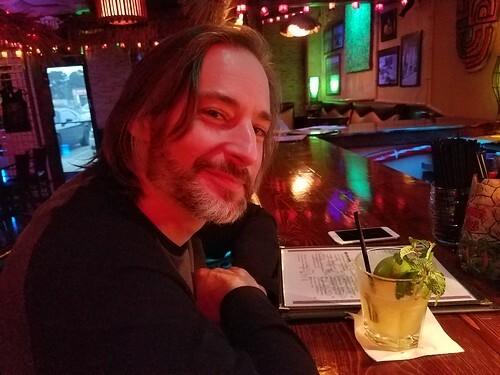 Without a doubt, Mark has created a wonderful place to relax over a nice meal and great drinks. 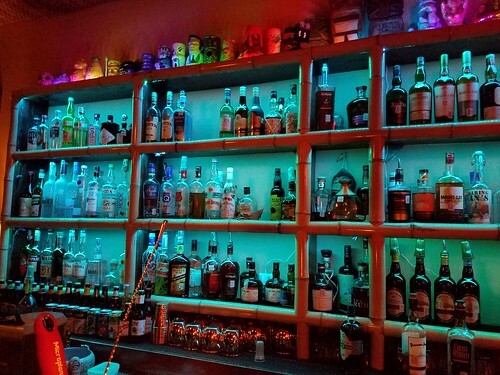 The rum selection is everything it’s cracked up to be – you’ll find something you will absolutely love. 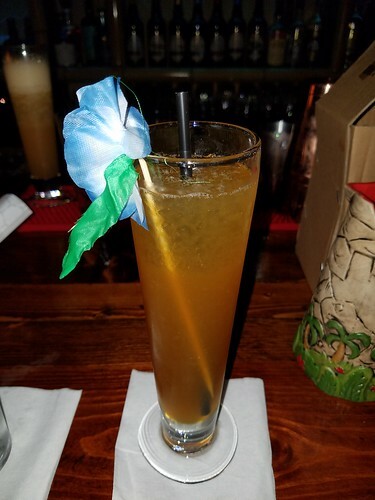 Menus change from season to season, and there are always new drinks to try – One of the newest ones is the Last Rites, made famous by the Mai Kai – so you know that the offerings are never boring! 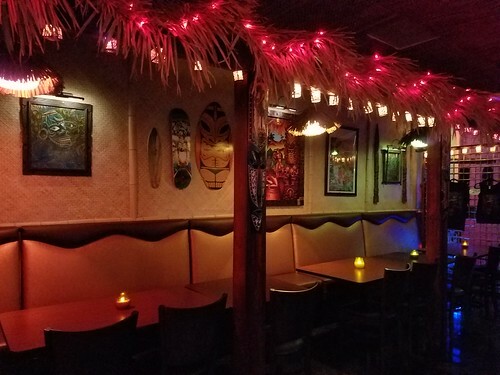 Be sure to make it a point to stop in if you’re anywhere near the Houston vicinity – this is a place that is truly tiki, and deserves the recognition. A big thank you to Mark for the hospitality and conversation – it was a blast!! Fantastic review, as always. I can’t wait to try this one out on a one-two punch with Lei Low before too long. Yes yes! We love Howies! Had a blast there recently. Just a stunning collection of cool. Excellent write up!